I really like wool as a material for bedding, so I was always going to love the Fogarty wool pillow. Wool is naturally hypoallergenic keeping dust mites at bay and it’s naturally climate controlled so stops you getting too hot or too cold. The Goldilocks porridge of pillows. Just right. The cover is a nice soft cotton but there is a polypropylene cover underneath, this makes it washable thought I’d stick to spot cleaning it as a washing machine can cause the filling to bunch. 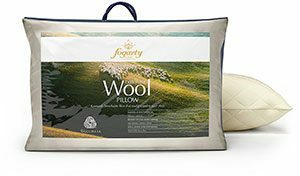 The Fogarty Pure Wool Pillow is filled with Woolmark endorsed 100% pure wool, which creates an exceptional quality pillow that could improve your sleep with a lot of benefits to the sleeper. Fogarty Wool “breathes” with our bodies, removing moisture swiftly and ensures a better night’s sleep. Fogarty have been manufacturing pillows and duvets in the heart of Lincolnshire for over 100 years and have maintained a reputation for producing a full range of only the highest quality filled bedding products to suit everyone’s needs.